The DPC-2 from ITW Dynatec is a distance-based adhesive pattern controller ideal for tracking and applying adhesive patterns on packaging lines with frequent line speed changes. The DPC-2 is dual channel and has permanent memory storage for up to 4 programs for varying application requirements. Fine-tuning of patterns can be performed on-the-fly to keep production running smoothly. 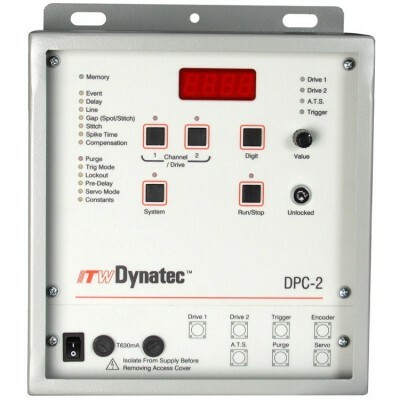 The ITW Dynatec DPC-2 Distance-based Pattern Control unit is a microprocessor-based electronic control system. It may be used in any process that requires the actuation of electrical output devices based upon distance traveled. It is specifically designed to control glue application valves used in adhesive systems. Examples of applications where the DPC-2 may be used include, but are not limited to, case sealing, labeling, and bag making. All controls and displays are mounted inside a rugged enclosure with a protective door. The enclosure meets environmental rating of IP54, protecting against water and solid object infiltration when the door is latched and all output/input receptacles at the bottom of the DPC-2 Control Unit are either connected to cables or capped. The display is a bright, seven-segment LED device that affords easy viewing at any angle and in any lighting environment. All connectors are standardized to simplify installation.